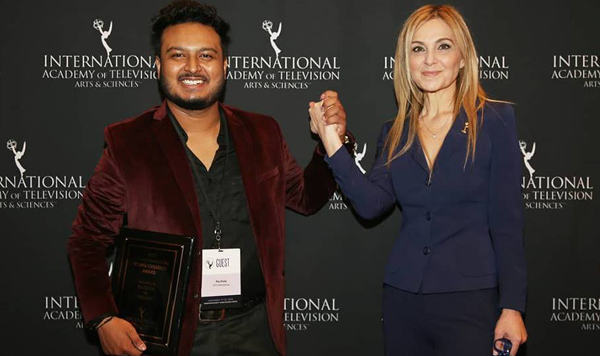 Guwahati boy Raj Dutta bagged the prestigious JCS International Young Creatives Award at the 2018 International Emmy World Television Festival in New York recently. He received the award from JCS International President Michal Grayevsky for his 1-minute short video called Tea Shirt. He is a student of Gauhati Commerce College. Tea Shirt shows how a young boy’s innocence can remind us that we can choose peace. The other two who won this award are Puti Puar of Indonesia and Shubham Upreti of India. Puar’s video titled Peace is Action is based on how we can seek peace through resisting online bullying. Upreti’s video titled Mr Peace is based on the story of a man who has been left behind by a fast moving world. The JCS International Young Creatives Award was open to persons around the world between 18 and 29 years of age. Contestants from 39 countries took part. The contestants were asked to create short videos on the theme ‘Stand Up for Peace’. The three winners were selected based on concept, execution, character development and creativity.